A song to play while you read about the Padres: “Afternoon Delight,” as sung by San Diego’s own Ron Burgundy. After the Machado signing and seeing how the team’s top prospects have performed so far in spring training, Padre fans are…well, they are in love. This is how they express it in song. This will be the most important season of San Diego baseball history. That’s not a high bar to clear. The Padres turn 50 this year and it’s been five decades of mediocrity and irrelevance. They have the worst winning percentage as a franchise across all 30 teams. Only 12 postseason wins (games, not series) and none since 2006. No winning season since 2010. The only team to have never thrown a no-hitter. The team’s history since starting in ‘69 has been…anything but nice. But things feel different this year. The Padres have signed the three largest contracts in franchise history in consecutive years, starting in 2017 with Wil Myers (somehow $83 million was a Padres all-time record), followed by Eric Hosmer at $144 million (I know I know, stop laughing) and then of course the surprise signing of Manny Machado this offseason for $300 million. Those signings come just as the farm system, the consensus best in baseball, is finally starting to bear fruit. This spring, the batters are hitting dingers all over Arizona. Pitchers are putting up zeroes on the mound. For what spring training records are worth (not much), San Diego had the best record in the bigs as of mid-March. The “hot talent lava,” as Scott Boras put it, is starting to erupt. Now, the Padres being the Padres, the bottom could fall out at any moment. Myers and Hosmer have been disappointments for all that money, and Machado aside, the rest of the roster doesn’t have much of a track record of success. But by the end of 2019, on offense they could have Fernando Tatis Jr. (#3 prospect on FanGraphs) at shortstop, Luis Urias (#24) at second base, and Francisco Mejia (#59) at catcher, along with Chris Paddack (#34) and Logan Allen (#93) on the mound. That’s five top-100 prospects to go along with other young talent on offense and on the mound. There is also the matter of the rest of the “hot talent lava.” The Padres have a ridiculous 13 prospects among FanGraphs’ top 130, more than enough to help swing deals if/when the team is in contention. Oh, and they’re finally bringing back the brown in 2020. So why is 2019 so important for the Padres? Because it will be clear by the end of the year if this is the prologue to the story of a perennial contender, one that will challenge the Dodgers death star atop the NL West for the 2020s. Or the Padres might just be doomed to just another half-century of irrelevance. Let’s see how high that hot talent lava can erupt. What is the Padres’ most recent accomplishment? The San Diego Padres’ most recent accomplishment was one of the biggest stories of the offseason, signing Manny Machado to a 10-year, $300 million contract. Beyond just reminding the rest of baseball that the Padres exist, it potentially sets them up to have one of the top infields in MLB between Machado and Eric Hosmer on the corners and prospects Fernando Tatis Jr. and Luis Urias up the middle. 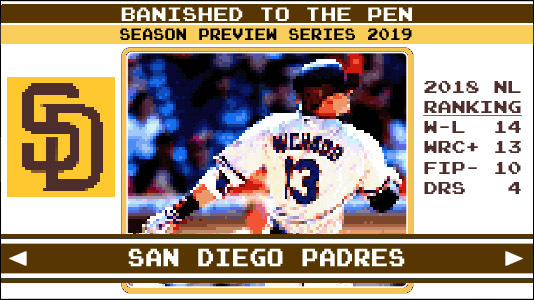 How will the Padres define success in 2019? San Diego’s window of playoff contention likely starts in 2020, but the Padres will be successful in 2019 if they can establish their first wave of top prospects, part of a farm system Scott Boras famously referred to as “hot talent lava,” as bona fide big leaguers. Eight Padres are in FanGraphs’ Top 100 prospects, and five (Tatis, Urias, Paddack, Mejia, Allen) are set to see MLB time in 2019. Franmil Reyes (the Franimal!) is the most Effectively Wild player on the Padres, and not just because he was the topic of one of Jeff Sullivan’s last deep dives on a player before departing from the EW world last month. Reyes, whose nickname is “La Mole” (translation: The Beast), put up a .280/.340/.498 triple-slash in half a season’s worth of at-bats in 2018, including .318/.385/.548 in the last two months, and has continued hitting prodigious dingers this spring. Reyes can clearly be Effective but there is a Wild range of outcomes for him in 2019 – he could hit 30-40 homers, he could go back to being the mostly mediocre player he was in the first half of 2018, or he could have injury problems as do many big beefy boys of his ilk. Oh, and he’s also Extremely Online with an active Instagram that includes frequent Q&A’s with fans. 2019 is the 50th anniversary of the San Diego Padres’ existence, so they have some good giveaways this year. The one with the broadest appeal, even for non-Padre fans, will be on July 27 when they will hand out San Diego Chicken bobbleheads. Besides Tony Gwynn and maybe Trevor Hoffman, the Chicken mascot is what many baseball fans associate with the Padres.